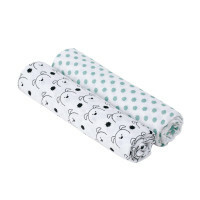 LASSIG’s swaddle & burp blanket 'dog' is pre-washed, breathable, easy-to-care-for, skin-friendly and can be used as a light blanket for babies. The 2 cloths are available in the handy size 47.2 x 47.2 inch. 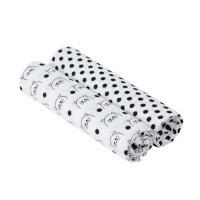 Product information "Muslin Swaddle & Burp Blanket XL, Little Chums Dog"
This muslin burp blanket for babies is made of pre-washed, easy to clean and breathable 100% cotton. The muslin swaddle & burp blanket can be used as a light blanket, as a nursing cloth or for swaddling babies. The 47.2 x 47.2 inch muslin blankets are available in a variety of colors with different designs. Available in a double-pack, these versatile cloths are guaranteed to be truly soft. The cotton will soften up even more after multiple washings. The muslin blanket fulfills Standard 100 by OEKOTEX ®, 09.HPK.70437 HOHENSTEIN HTTI and can be washed at 140 °F.